Wash rice in water, two or three times. 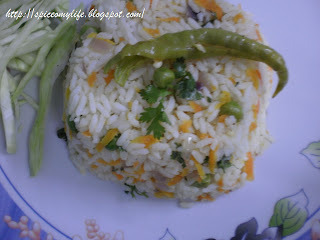 Add water one and half times the quantity of rice and pressure cook till two whistles. You can add one tsp oil and one tsp of lemon juice so that the rice is not over cooked and each grain remains separate. Lemon juice makes it whiter. 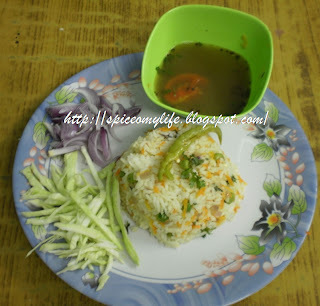 When the cooker cools down, remove the rice and spread it on a platter. Fluff it with a fork and leave it to cool. Clean carrots, peel and grate. Chop the onions finely. Slit the chillies length wise. Those who dont like it too spicy can use one or two chillies. Alternately pepper powder can be used. White pepper powder is less spicy. Now heat oil in a pan. Ghee gives a better taste. Add cardamom, cloves, cinnamon and bay leaf. After a minute add chopped onions, mix and fry till they turn pink. Adding a tsp sugar gives a good taste and also adds shine to the onions. Fry till it starts crackling. Serve hot garnished with finely chopped coriander greens.